There are some really impressive and amazing examples of using CSS Variables in animation out there, like this single div accordion or this sunrise/sunset scene. How could you not want to give CSS Variables a spin in your own animation after seeing things like that? Here are 4 ways CSS Variables can be helpful for animation even if you’re not making fancy demos like these. See the Pen Spring physics with CSS variables by Val Head (@valhead) on CodePen. Quick tip: CSS Variables are also called CSS Custom Properties, and personally I find it easier to think of them as custom properties as they don’t really behave like the kind of variables you might be used to from programming languages. The re-useableness of CSS keyframe animations can be their biggest strength. Bringing CSS Variables into the mix can get you even more flexibility from a single set of keyframes because they can be altered dynamically with CSS too. By establishing some variables with values on a parent container, you can adjust the value of those variables for each individual child element to affect how their @keyframe animation plays out. See the Pen CSS Variables in Keyframes by Val Head (@valhead) on CodePen. Sometimes it’s super annoying to have things like translte(), scale() and rotate() all wrapped up in one property. There’s some indication those will become separate properties in the future (It’s behind a flag in Chrome Canary already), but you can have it all now using CSS Variables if you want. Dan Wilson does a great job showing how CSS Variables can help you get around that in this post. See the Pen CSS Variables – media queries by Val Head (@valhead) on CodePen. calc() doesn’t work with all units in Firefox at the moment and Edge has some issues with page crashing and pseudo elements. Based on that, CSS Variables probably aren’t ready for production work just yet, but that will likely change in the near future. CSS Variables: Why Should You Care? is also a great read. This article was written for the UI Animation Newsletter. 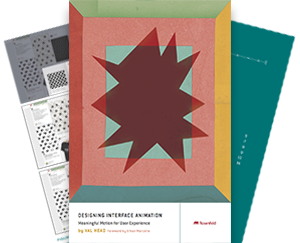 Subscribe to get weekly UI animation tips and resources straight to your inbox! ← Big news: I’ve joined Adobe!